British architect Alison Brooks has won a competition to design a new quadrangle for a college at the University of Oxford. The third campus for Exeter College will provide accommodation for 100 students, a lecture hall, classrooms, private study rooms and breakout spaces. The buildings will be arranged into an S-shaped plan and will fold around two new courtyards with surrounding cloisters. Pitched roofs with curved edges will wrap over each new block and will be visible behind the retained facades of existing buildings on the site. The project is scheduled for completion in 2014, when the college is celebrating its 700 year anniversary. You can see a selection of projects by Alison Brooks Architects here, including a housing development that won the Stirling Prize in 2008. 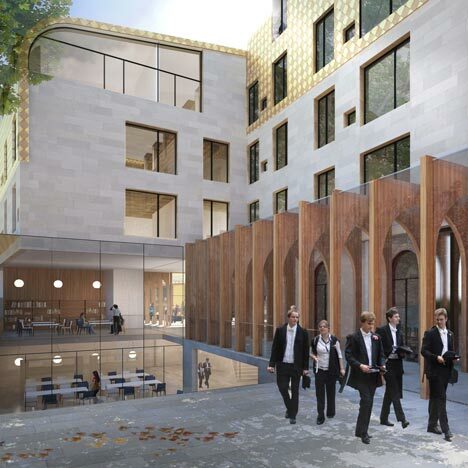 Alison Brooks Architects has won the competition to design a `third quad´ for Exeter College at Oxford University. Located a ten minute walk away from the 700-year old Turl Street campus, the project will form Exeter College’s Third Quadrangle in the heart of Oxford. The new building will combine undergraduate and graduate living accommodation for 100 students, a lecture hall, teaching rooms, social spaces and study facilities. ABA's scheme is organised around two new courtyards, a 19th C and a 21st C Quad, connected by a 3-dimensional Ambulatory. This is a narrative route that connects the College’s public and courtyard spaces with a series of cloisters, amphitheatre staircases, landings and garden walks - places for gathering and scholarly exchange. A multi-level commons space at the centre of the S-shaped plan is the new Quad’s social heart, opening onto both courtyards at various levels. The over-riding concept of a 'scholarly home' is characterised by an all-embracing curved roof, marking the new Quad on Oxford’s skyline while providing unique loft study and living spaces. Alison Brooks Architects was one of five leading architectural practices from the UK and abroad shortlisted for the project, including Eric Parry Architects, Haworth Tompkins, Wright & Wright and Richard Sundberg Architects. ABA's consultant team includes Stockley, Max Fordham, Davis Langdon, Richard Griffiths, Dan Pearson, Fetherstonhaugh & Montagu Evans, with the competition organised by Malcolm Reading. The project is scheduled for completion in 2014 to mark Exeter College’s 700th anniversary.